We had this in the Country Music thread but maybe this is interesting as well for people who don't look into that thread. Publicity shot for the movie "Stagecoach"
Oh man, I'm sorry you where disappointed. I heard about The Highwaymen (the folk group) but didn't think about making it clear in the topic title that it's about Cash, Nelson, Kristofferson and Jennings' group. Anyway, maybe you find some stuff of them that you like. Country and Folk are not that distant in some ways. Thanks, Rocker, for the time and effort in assembling those links. They're great! I have to comment on one in particular, and that would be the Holmes 1991 interview. I can't believe the questions that interviewer asked - and got answered! Those "loaded" questions were bold to ask anybody, but to ask those four outlaws? Wow! And, he actually got them to sing (well, recite...) some songs right off-the-cuff. 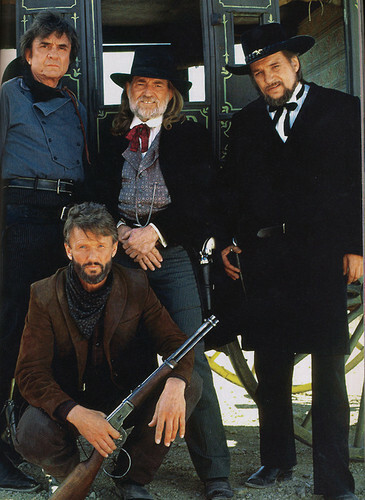 I like all four of those guys, and years after their death, I still miss Johnny and Waylon. I saw an interview with Willie a few years ago and he was talking (I don't know how serious he was) about reforming The Highwaymen with, I believe, Merle Haggard and (maybe?) George Jones. Obviously that didn't come to pass. Rocker, I have a quick question for you. As I mentioned above, unfortunately, I "missed" The Highwaymen era. So I just wikipedia'd them, and checked out their discography. I'm assuming they sold out every concert, but it looks like, for some reason, they didn't overwhelm on the record charts. Their first two albums did pretty well I guess, but the third didn't. And, other than their debut single, "Highwayman" (which I do remember hearing), they never had another hit single. That's surprising considering the songwriting chops of the four members; it kind of reminds me of the Beach Boys. Anyway, should have one of their songs done better? Did they save their best material for their solo albums? Was there a hidden gem that should've been a hit? I think it had more to do with the way country music works, unfortunately. It's all based out of the same record labels in Nashville, and "Payola" is REAL in the country radio business. Next time you watch a country awards show, watch how careful the act is to thank, quote, "country Radio". They'll say things like "Thanks to Country Radio for playing this..." or "We sent this out to Country Radio" they talk about it like it's a conglomerate, because it IS. Even as loved and respected as WayMore Willie Johnny Kris were, if they were doing things their own way they may have had trouble getting their stuff played. It's almost completely slow, strange AC ballads by neutered country singers. There's a little bit of grit in there but not much. ALL of those songs were played because "Country Radio" pushed them to the moon. One "f*** You" from Waylon Jennings and the Highwaymen don't get played as much. Hopefully Rocker has more insight. I remember a feature on Primetime Live or 202/0 when the 3rd album came out; here you have 4 legends of American music, and their record can't get played on country radio in 1995. Kris said he never got airplay, anyway. Of course the programmers were all programming youth, those desire able 25-45 demographics. All those big hat and hair guys we don't remember 20 years later. Well, I missed that era myself as I was born in '84. But I can try to think of a few things. But this is all speculation on my part of course and certainly not thought out entirely. Hope what I mean comes across. As Ron already said, the 80s were a hard time, especially for "legends". You have to understand that they didn't have quite the same status they have now. Cash didn't sell anything and Columbia even went as far as firing him. The live shows were still going strong of course but attempts to make him younger and more hip were unsuccessful. It even got downright ridiculous ("Chicken in black" for example). Willie had some big hits ("Always on my mind" "To all the girls I've loved before") but I don't think he had many hit albums. Some of the stuff he recorded around this time was really awful imo. Very 80s sounding and plastic. Interestingly some of those recordings were produced by Chips Moman who also produced the Highwaymen albums 1+2 plus had his band on the albums (the erstwhile 827 Thomas Street band). BTW he produced the Class Of '55 album as well, which to me is just as disappointing mostly. I don't know what was wrong. Chips Moman was/is such a great producer and the band is fantastic. But maybe they just were too much going with a mainstream sound. And it would've been cool to have seen Willie and Waylon's guitar chops being used. Waylon also had big albums but at one point his records also started not to sell very well. Kris, I don't know. I guess he was busy making movies. But as far as his records go, I have no idea. So in the end, this was probably just a novelty act for many people. The "Highwayman" single was a hit but that's about it as you already said. I don't think the second album is very good at all and there definitely is a song missing that had potential (the single was "Silver Stallion" https://www.youtube.com/watch?v=jU4caMqKssg and it couldn't sound any more like radio). Imo especially the second album was trying too hard to sound contemporary in parts and it just doesn't work if you put a certain form onto individuals whose power lies in their originality. "American remains" is a shameless re-write of "Highwayman". Interestingly the guys wrote most of the songs on the second album themselves (the first one had a cover of Cash's "Big river") and imo you can get a glimpse of what could've been on Willie's "Texas". But for some reason the production doesn't suit them well and the contrast with the mainstream-songs is just too big imo. Plus each of them wrote better songs before. The third album is just great. Don Was produced it and it really sounds like Country Music. To this day it doesn't sound dated but as if it was recorded this year imo. Each guy contributed one song. In the case of Kris and Willie at least those songs were new versions of songs they recorded solo. Around this time Don Was also produced Waylon's "Waymore's Blues Part II" album btw. "The road goes on forever" had a couple of songs with hit- and radio potential imo. At that point Cash was hot on his comeback trail. But I think country radio even ignored that. Gosh, I hope this isn't too all-over-the-place. I just typed down what came to my mind in a hurry because I just got back from university. I can confirm that there was no Cash comeback on "Country Radio" they didn't play any of it. So while he was selling more, was being played on mainstream radio, had music videos out, Country pretty much ignored him. It's very much STILL like that, by the way. They literally play the same 20 songs over and over again, sometimes in order on most country stations. Then every once in awhile they'll play a few songs from 10 years ago that were also part of the 20 songs they played over and over again back then... it's very frustrating. In a way it's even worse than the pop channels because at least those have some chance that a breakout artist makes it through. in Nashville the machine determines exactly who's going to make it. Sometimes that's somebody talented, many times it's not Of course there are exceptions like the excellent WSM 650 out of nashville (AM station) that runs the Opry, they will play anything and everything throughout the day, I've heard "Bro Country", tons of classic 60's and 70's country, live recordings from the 50's and even gospel songs from the 30's played live on the air from that channel. The Opry will also let new acts that don't even have record deals perform live on the show from time to time. Back to the Highwaymen though, I haven't heard all their stuff but you can see how if the record company was pushing them to be more adult contemporary/cheezy 80's country sounding it would completely destroy their credibility with the audience and nobody would really enjoy that music. Hence low chart positions even if they did manage to get played on radio stations. Of course there are exceptions like the excellent WSM 650 out of nashville (AM station) that runs the Opry, they will play anything and everything throughout the day, I've heard "Bro Country", tons of classic 60's and 70's country, live recordings from the 50's and even gospel songs from the 30's played live on the air from that channel. The Opry will also let new acts that don't even have record deals perform live on the show from time to time. That's cool to know. I always wanted to learn about current radio stations that I can listen to online that play good country music. Thanks again for all the links and information, Rocker, Ron, and Lonely Summer. What you guys posted makes sense...unfortunately. The timing just wasn't right for The Highwaymen commercially, as crazy as that seems now, being those four are such icons today. But, I get it; those were different times. There is something "not quite right" with a lot of those Highwaymen songs. I mean, it's like they almost make it, they almost get there, but, somehow they do fall a little short. Don't misunderstand, I like them, some a lot, and their voices were still in fine form. I guess I can't help comparing them to the previous "glory days" of Willie, Waylon, Johnny, and Kris. Maybe those guys did, in fact, peak as songwriters, though Willie in particular had a few more up his sleeve - I love "Still Is Still Moving To Me". I especially enjoy the live performances. Obviously they were enjoying themselves, and they also appeared to take a certain pride in their own individual songs. It's like they knew they were good, but yet still wanted to prove it to each other, and obviously enjoyed the audience's reaction. I think they really liked the adulation, and they deserved it. All that being said, as I said in my above post, I am still a little surprised that, between those four songwriters, they didn't maybe luck into another big hit. You guys explained how they faced some obstacles, but a great record is a great record. 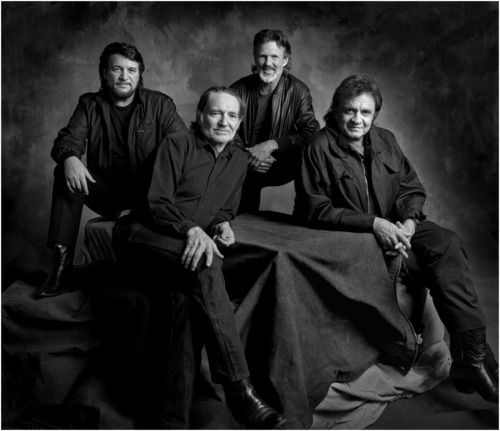 I wish I would've seen The Highwaymen live. I have a feeling I would've gone to see them a couple of times. I was lucky enough to see Willie Nelson twice as an opener for Bob Dylan, and I'm serious, I actually enjoyed Willie's sets more. We don't know how much longer Willie and Kris are going to be around. Willie has had some lung problems and Kris has talked about some memory issues. I think I'm going to purchase this Highwaymen boxed set. Another interesting thing to think about too is, although guys like Willie still tour and do all kinds of stuff and is a household name, compared to super-hot modern acts he's not doing much. For instance, I saw about 7 or 8 years ago a show locally, probably had 8 or 9000 people there, but it was Willie Nelson, Merle Haggard, and Ray Price all in 1 show. That's arguably as big of a deal as the Highwaymen were, and there were only 8000 or 9000 people there in a huge market in the south nonetheless (it was in Charlotte, NC). So part of it may be our opinion of how big Johnny Cash, Waylon, etc. were is over exaggerated... I'm not sure... it's kind of like Brian, he's a household name and to us seems like what the sun revolves around but at the end of the day I wonder how big of a deal he REALLY is to the general public. Beach boys music has nearly 100% musical recognition in the U.S. but yet Brian's shows are to 2 or 3000 people sometimes. And he's fairly reclusive and doesn't tour as often as a lot of acts. I just think stuff like that is hard to actually understand and conceptualize in your head... the Highwaymen were certainly big, really big, and legends... but were they bigger than "Brooks N' Dunn" ? I don't know to be honest. While regarded as legends, it seems to me that country music wasn't really totally accepted by the mainstream until Garth Brooks came around and added some pop-ness to country. Although his music was country with the tinge of pop. Now, modern country seems to be pop with a tinge of country. As for Brian, I really don't think Brian is nearly as highly regarded among the general population as he should be. Oh yeah, that's the "Last of the breed" show. I think it's on DVD and I have the double album (including guest spots by Vince Gill and Kris Kristofferson, Jordanaires on background vocals). It's really a nice album with some very cool "old men country playing" in the best sense. I might put it on right now. BTW guys I just realized that my earlier message was maybe a little misleading. My biggest problem with the Highwaymen albums is with the second. I think that that one was really done wrong and stays way behind it's potential. The first one actually is a pretty good album. Apart from the hit single you can also accept the slick sound. Some highlight to me are "Jim, I wore a tie today" and "Comitted to parkview", both sung by Cash and Nelson. And the last one certainly is a very honest song and something that probably wouldn't be played by country radio. I always have to laugh at Cash's impersonation of a crazy man yelling that he feels "fan-TAST-ic". "Desperados waiting for the train" actually is one of the first two song I distinctly remember hearing in my life; the other is "Radio lover" by George Jones. I'd say that goes for The Beach Boys as well. After all it was not just Brian who did everything (although he surely was the most important one). Willie and Kris certainly still wrote some great songs in later years. But I guess tey really didn't have to prove anything. It's no insult to say that all in all they did their greatest work in earlier decades. The live shows are really cool imo. They more or less each play their own show and then play some Highwaymen songs in between. I look forward to the boxset. Am wondering if they ever played a couple more songs of the Highwaymen albums than just a couple. If not, it's telling I guess. You're right, Brian didn't do it all, so there should be more recognition for the Beach Boys. But a perfect storm of poor decisions, poor management, and a long patch of mediocre albums kept that from happening. So yeah I guess he kind of kicked it more into mainstream, but of course where I'm from Country was always a big deal. Amazon has the boxed set available for pre-order at $59.98 or $69.98 for Blu-ray. The Highwaymen did what I'd always wished the Traveling Wilburys had done - play live! I would think, just sitting in the audience before one of those Highwaymen shows, the buzz had to be pretty strong. "We're sitting here about to see 4 of the Legends!" And then when the guys would amble onstage....wow. Wish I could have been there. Will have to check out that dvd set. A Traveling Wilburys concert......just imagine trying to put that setlist together. If Roy didn't pass away, you never know. Even without Roy, it could have been a great show. I guess the closest they ever came was the Dylan 30th anniversary show in '92 @ MSG - Bob, George and Tom were all there; along with Roger McGuinn - at one point, rumoured to be a replacement for Roy. Thanks! I posted another article in the Country Music thread but this one is much easier on the eyes. I don't know what I should think about this. I don't like re-recordings and Kristofferson already did his share of those. How many (if any) new songs are on this album? Let's include stuff he has written but never recorded himself (The Loving Gift).